The Boyer's Chatter Box push-button call gets a mixed review from me. It is a really good sounding call. It purrs, yelps and clucks with real nice sounds and tone quality, and with little effort. That's what I like about it. What I don't like at all is the construction of this call. A rubber band is used to bring the friction board back to it's resting spot after being pushed to make a call. This rubber band is very thin and has a difficult time staying put in it's holding groove. You'll be messing with it all day in the woods, because after it rides around in your pocket for a few minutes the rubber band comes off. Additionally, the bottom "wall" of the call, where the screw goes, is a sheet of wood that is practically paper thin - much too thin. I pressed on it just a little to see how sturdy it was and it started to crack. 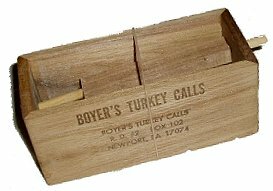 My definition of a quality hunting product, be it turkey call, tree stand or whatever, is one that is sturdy and serves it's purpose well with a minimum of maintenance/fuss to keep it in good working order. The Boyer's Chatter Box call doesn't meet that definition, in my opinion. Despite the good sounds it is capable of making, I won't hunt with it in the future because of the hassle to keep it working and the potential of breakage from poor construction.